ART REVIEW: "Tolkien: Maker of Middle-earth"
“Tolkien: Maker of Middle-earth” at the Morgan Library and Museum in New York City brings together the largest collection of materials relating to the internationally renown author JRR Tolkien ever assembled in the United States. Drawn from the Bodleian Libraries (Oxford), Marquette University Libraries (Milwaukee), the Morgan, and private lenders, the exhibition includes family photographs, hand-written manuscripts and personal items connected to the author and his family. In addition and most importantly for purposes of this review, the exhibition showcases Tolkien's abilities in the visual arts including both stand-alone works and illustrations for his books. John Ronald Reuel Tolkien (1892–1973) did not start out to be a famous writer. Although born in South Africa, Tolkien grew up in England. His father died when he was three and his mother died when he was 12. Father Francis Xaviar Morgan became his guardian. Educated at home until that point, Tolkein was enrolled in King Edward's School in Birmingham. Later, he attended Exeter College, Oxford, graduating in 1915 with first-class honors. After serving as an officer in World War I, he went to work for the Oxford English Dictionary, focusing on words that began with the letter “W.” This was followed by a series of academic positions with various institutions, which eventually led him to a fellowship at the University of Oxford teaching Old English and Saxon languages. Tolkien had long had an interest in adventure stories and mythology so he began at an early age to create a world of his own making populated by elves and wizards. It would eventually be known as “Middle-earth.” As he grew more mature, this world became the basis for what he hoped would be a mythology for England. After he married and had a family, Tolkien wrote a series of tales for his children arising out of the world that he had created. These were not written for publication but a friend at a publishing house persuaded him to submit them and they were eventually published in 1936 as The Hobbit. The Hobbit was a great success and the publisher clamoured for a sequel. For more a decade, Tolkien worked on the sequel but rather than another children's book, the work became darker and more adult. It was published in the early 1950s as The Lord of the Rings. Even after achieving international fame, Tolkien remained an academic at Oxford. He also contunued to develop the world that he had created seemingly without regard to publication. What is particularly striking about the world that Tolkien created is that he did not simply write stories about it. Rather, he created a language, wrote its history, penned poems, did calligrophy and drew maps. He also created paintings and drawings for it. He began to create such visual art long before there was any thought of publishing his stories. For example, the exhibition includes a fantasy landscape that dates from Tolkien's undergraduate days. Done in watercolor and ink, it is strikingly bold with both abstract and naturalistic elements. It does not belong to any school or style of art. Perhaps in some ways, it is closest in style to the works of William Blake a century earlier but not very close. In any event, the work is able to stand on its own without reference to any of Tolkien's stories. Tolkien might well have achieved recognition nonetheless if he had selected visual art rather than words as his primary means of expression. As the exhibition chronicles, Tolkien did do illustrations that were used in his most famous books. These include the dust jacket for The Hobbit as well as interior illustrations. The latter are somewhat more naturalistic than Tolkein's undergradute paintings. Still, they are unique in style. While most of Tolkien's visual art related to Middle-earth, he also did some unrelated work. Each year, he would write letters to his children that purported to be by Father Christmas (Santa Claus). These would include stories about Father Christmas and the helpers who Tolkien created and were illustrated with paintings and drawings. Also included in the exhibition are a number of designs that Tolkien drew on pieces of newspaper. These were doodles that he made while doing crossword puzzles. However, the colors and intricate designs make them works of art. This exhibition is not just for Tolkien fans. It provides a glimpse of a truly creative mind that expressed itself in a host of different ways. As such, it should be of interest to anyone intersted in creativity. 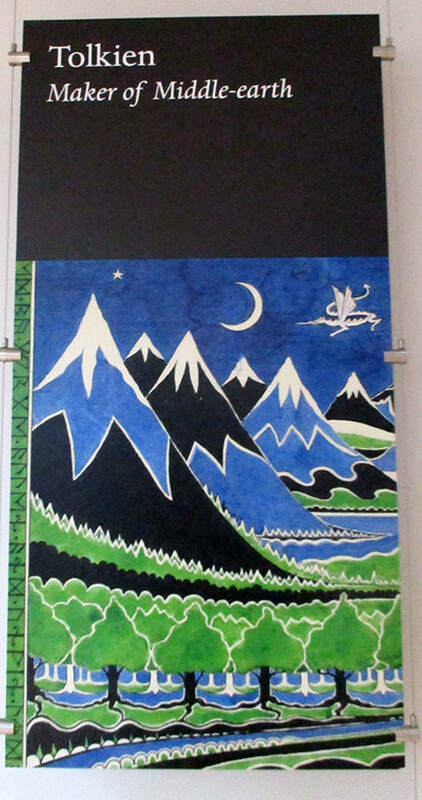 Art review - Morgan Library and Museum - "Tolkien: Maker of Middle-earth"